Applications are invited from eligible Indian citizens for the post of Development Assistant in (NABARD) Those candidates who are interested in NABARD they can read official notification care fully and apply before last date of online apply 27 august 2018 to 12 September 2018 brief information mention below. Age limit (as on 01-08-2018) : Between 18 and 35 years. Candidates born not earlier than 02-08-1983 and not later than 01-08-2000 (both days inclusive) are eligible to apply. Educational Qualification (as on 01/08/2018) : Bachelor’s Degree in any discipline from a recognized University/Institutions with a minimum of 50% marks in aggregate (pass class for SC/ST/PWBD candidates). 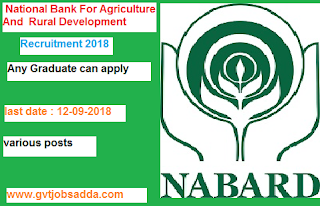 For more detailed information about Educational Qualification & Age limit in National Bank For Agriculture And Rural Development Recruitment candidate can check the Official Notification. C. Documents Scan and Upload Candidates can apply online only from 27 August 2018 to 12 September 2018 and no other mode of application will be accepted. Pay Scale in NABARD : Selected Candidates will draw a starting basic pay of Rs. 14,650/- per month (including two advance increments) in the scale of Rs. 13150 -750 -15400 – 900 -19000 -1200-26200 -1300-28800-1480-33240 -1750 -34990 (20 years) and other allowances, viz. Dearness Allowance, House Rent Allowance, City Compensatory Allowance, Transport Allowance etc., as admissible from time to time. At present, initial monthly Gross emoluments for Development Assistants is approximately Rs.31,000/-.